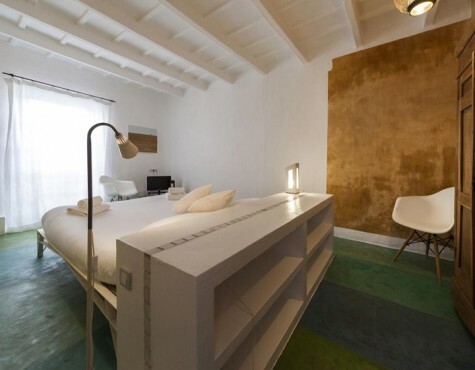 Located in the heart of Ciutadella, and yet a haven of peace and tranquillity with a very authentic feel. They say that emotions are pure chemistry and that light can shape our feelings. At SODIUM we’ve taken the risk of playing around with the symbolism of elements to turn a 19th century stately home in the main street of Ciutadella into a small and unusual hotel. Our aim is to transform the metals that give each of the six rooms their name into the essence of relaxation, with a light that fills every corner and boosts your energy to go out and fall in love with our enchanting island. We offer you a house where you can sleep and rest your body and soul in attractive and comfortable rooms. We serve breakfast every morning in the hotel’s only communal area on the ground floor, all delicious fresh produce from the nearby market. We prepare fresh fruit daily, plus something sweet to tempt you whenever you feel like it. There is a courtesy coffee machine, daily newspapers for you to browse, and all the friendly help and recommendations you require to make the most of your stay in Menorca. SODIUM combines a cosmopolitan and urban style with the lovely original features of the house. Whites, metallics, cement floors, simple and stark design, a huge black marble bar as soon as you step inside...even the artworks we have selected conjure up industrial lofts while blending with the old wrought iron banister on the main staircase. The ceilings’ beams are exposed, there is a mosaic floor and some of our lamps and furniture are reminiscent of the sixties style.